For the Dragon Duelists here this weekend, it all comes down to this! Michael Cameron Monk from Alabama won yesterday’s Dragon Duel with Crusadia Guardragon while Kenta Lee from Texas won today’s Dragon Duel with Salamangreat. 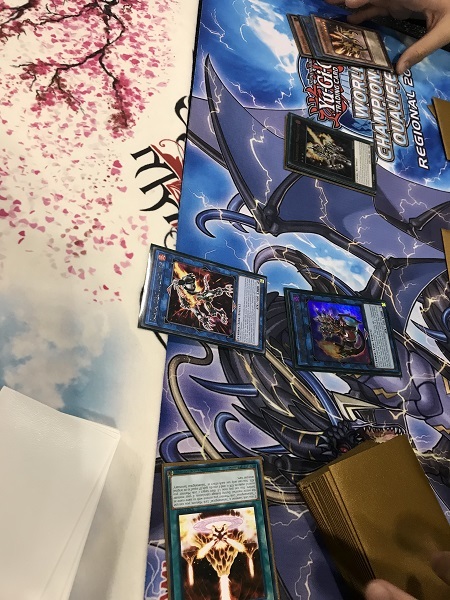 One of these Dragon Duelists will walk away with a set of Super Rare Darklords: the previous YCS Prize Cards Darklord Asmodeus, Darklord Superbia and Darklord Edeh Arae. It’s time to Duel! Monk Normal Summoned Crusadia Leonis then sent it to the Graveyard to Link Summon Crusadia Magius then Special Summoned Crusadia Reclusia from his hand using its own effect. He then used Magius’s effect to add Crusadia Draco from his Deck to his hand. He used both monsters to Link Summon Crusadia Spatha. He then Special Summoned Draco, then used Crusadia Spatha’s effect to add the Leonis in his Graveyard back to his hand. He then sent Draco to the Graveyard to Link Summon Guardragon Elpy behind Spatha and Lee Special Summoned Fantastical Dragon Phantazmay to draw 3 cards and send 2 cards back to his Deck. He then activated World Legacy Guardragon to Special Summon Crusadia Draco from the Graveyard. He used all 3 monsters to Link Summon Saryuja Skull Dread. He used Saryuja Skull Dread’s effect to Special Summon Crusadia Leonis from his hand. Saryuja Skull Dread attacked into Lee’s Salamangreat Miragestallio and Lee used the Salamangreat Baelynx in the Graveyard to protect Salamangreat Miragestallio from being destroyed by battle. Monk Set 2 copies of Called by the Grave but they were destroyed by Lee’s Set Salamangreat Rage in the End Phase. Lee activated Salamangreat Miragestallio’s effect, Special Summoning Salamangreat Falco from the Deck. Next, Salamangreat Jack Jaguar came out of the Graveyard and he used Salamangreat Miragestallio and Salamangreat Sunlight Wolf to Link Summon Salamangreat Heatleo across from Monk’s Saryuja Skull Dread. All of Lee’s effect cleared Monk’s Saryuja Skull Dread and the World Legacy Guardragon, leaving only Crusadia Lenois on Monk’s field. Lee activated Salamangreat Gazelle’s effect from his hand to Special Summon it and then used the on-Summon effect to send Fusion of Fire to the Graveyard from the Deck. He then used Falco and Salamangreat Jack Jaguar to Link Summon Update Jammer. Next, Lee activated a Set Fusion of Fire, sending a Salamangreat Spinny from his hand and Update Jammer from his field to Fusion Summon Salamangreat Violet Chimera. It gained ATK from its effect and Spinny came out of the Graveyard after that. Gazelle crashed into Monk’s Crusadia Leonis and the rest of Lee’s monsters attacked directly to end the first Duel. Lee started off with a Normal Summoned Flame Bufferlo. He sent it to the Graveyard to Link Summon Salamangreat Baelynx. He activated Flame Bufferlo as Chain Link 1 and Baelynx as Chain Link 2 and Monk chained Ash Blossom & Joyous Spring to negate the Baelynx effect to add Salamangreat Sanctuary to Lee’s hand. Lee resolved Flame Bufferlo by discarding Salamangreat Spinny and drawing 2 cards. He then activated Salamangreat Gazelle from his hand and Monk chained There Can Be Only One to send Gazelle to the Graveyard. Lee then activated Monster Reborn to Special Summon the Ash Blossom & Joyous Spring (a Zombie) in Monk’s Graveyard, then used it and Baleynx (a Cyberse) to Link Summon the Link 2 Spellcaster Hiita the Fire Charmer, Abalze! Hiita’s effect let Lee Special Summon Monk’s Ash Blossom & Joyous Spring yet again. He sent Ash Blossom & Joyous Spring and Hiita to the GY to Link Summon the Cyberse Monster Salamangreat Heatleo! Hiita’s effect allowed Lee to completely play around There Can Be Only One! Heatleo attacked and destroyed Monk’s F.A. Dawn Dragster. Monk drew Gameciel, the Sea Turtle Kaiju. He still had a Hot Red Dragon Archfiend Abyss on the field. He Normal Summoned Crusadia Reclusia. Monk attacked with Hot Red Dragon Archfiend Abyss into Lee’s Heatleo and Lee banished Baelynx from his Graveyard to keep Heatleo on the field. Lee went into the tank to try and find an answer to There Can Be Only One but had to pass. Monk used World Legacy Succession to Special Summon Ash Blossom & Joyous Spring from his Graveyard to the zone directly in front of Lee’s Heatleo. He then Tribute Summoned Reclusia and Ash Blossom & Joyous Spring for Gameciel, the Sea Turtle Kaiju! Hot Red Dragon Archfield Abyss attacked and destroyed Hetaleo and Gameciel, the Sea Turtle Kaiju attacked directly. Kyoutou Waterfront had 5 counters on it giving Gameciel, the Sea Turtle Kaiju the ability to negate any card or effect activation (except another Gameciel) and banish the card. Lee Set a monster and 2 to the backrow and passed. Monk attacked with Hot Red Dragon Archfiend Abyss, destroying Lee’s Set monster and then attacked with Gameciel, the Sea Turtle Kaiju to take this match to a third and final Duel! Lee elected to go first. In the Draw Phase he activated Salamangreat Circle from his hand, adding Salamangreat Gazelle to his hand. Flame Bufferlo and used it to Link Summon Salamangreat Baelynx. Lee Salamangreat Baelynx and Chain Link 1 and Flame Bufferlo as Chain Link 2, and Monk chained Fantastical Dragon Phantazmay from his hand as Chain Link 3. 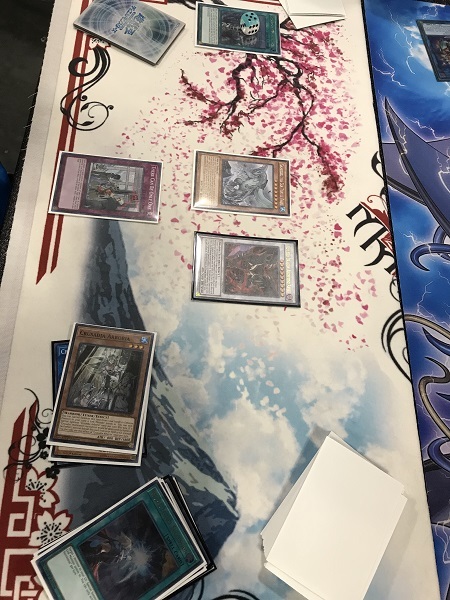 Lee drew 2 cards then cringed as he drew the only Salamangreat Sanctuary in his Deck leaving none in the Deck when Baelynx resolved. Monk got a free look at Lee’s Deck. Next, Salamangreat Gazelle was Special Summoned and its effect sent Salamangreat Rage from his Deck to the Graveyard. Gazelle and Baelynx were used to Link Summon Salamangreat Sunlight Wolf. Salamangreat Sanctuary came down next and was used to Link Summon Salamangreat Sunlight Wolf using the first one as the only Link Material whose effect let Lee add the Salamangreat Rage back to his hand from the Graveyard. He Set 3 to the back and passed. Monk Normal Summoned Crusadia Maximus which was sent to Link Summon Crusadia Magius. He then activated Monster Reborn targeting his own Maximus which was Summoned behind Magius. Magius’s effect let Monk add Crusadia Arboria from his Deck to his hand. He then used both Crusadias to Link Summon Crusadia Spatha. Crusadia Draco was Special Summoned behind Spatha and Draco’s effect let Monk add Maximus back to his hand. Draco was used to Link Summon Guardragon Elpy. Spatha’s effect moved Elpy one zone over, and when the Chain resolved, Lee activated the Set Salamangreat Rage to destroy Phantazmay and Elpy (Salamangreat Rage doesn’t target the cards it destroys, so Monk’s Fantastical Dragon Phantazmay was unable to negate Salamangreat Rage). Monk continued by Special Summoning Crusadia Arboria in front of Lee’s Salamangreat Sunlight Wolf. Lee activated Salamangreat Sunlight Wolf’s effect to add a Salamangreat card in his Graveyard back to his hand. Monk then Special Summoned Crusadia Maximus behind Crusadia Spatha. Monk used all of his monsters to Link Summon Borrelsword Dragon. He then Special Summoned Black Dragon Collapserpent by bashing Crusadia Magius from his Graveyard. Black Dragon Collapserpent was the target of Borrelsword’s effect, switching it to Defense Position. Black Dragon Collapserpent was used to Link Summon Guardragon Pisty. Monk activated Black Dragon Collapserpent’s effect but Lee chained his Set Called by the Grave to banish it and negate the effect. Pisty’s effect let Monk Special Summon Phantazmay to the zone that it and Borrelsword pointed to. Borrelsword attacked and its effect activated but Lee chained Salamangreat Circle to make Salamangreat Sunlight Wolf unaffected by card effects this turn, keeping its attack in place. Lee protected Salamangreat Sunlight Wolf from being destroyed and Monk attacked with Borrelsword again, destroying Salamangreat Sunlight Wolf in battle. Fantastical Dragon Phantazmay and Pisty attacked directly, leaving Lee at 400 LP. Lee drew to 3 in hand. He Normal Summoned Salamangreat Gazelle and activated its effect, Monk chained Borrelsword’s effect to switch Gazelle to Defense position. Monk sent Salamangreat Jack Jaguar to the Graveyard from the Deck. Gazelle was sent to the Graveyard to Link Summon Salamangreat Baelynx. Salamangreat Jack Jaguar was activated, sending Salamangreat Sunlight Wolf from the Graveyard back to the Extra Deck to Special Summon Jack Jaguar. Salamangreat Falco was Special Summoned form the Graveyard, sending Jack Jaguar back to his hand. Salamangreat Sunlight Wolf was Link Summoned next, then Lee activated Fusion of Fire, using Falco and Monk’s Borrelsword Dragon as material. Violet Chimaera’s effect let it gain ATK points. Salamangreat Sunlight Wolf attacked over Pisty and Violet Chimera attacked over Phantazmay, leaving Monk at 4400 LP. In Main Phase 2, Lee used the effect of Salamangreat Sunlight Wolf to add back Salamangreat Rage from his Graveyard to his hand. He Set a card and passed. Monk drew Ash Blossom & Joyous Spring, to add to his hand of Dinowrestler Pankratops and Black Dragon Collapserpent. He Special Summoned Dinowrestler Pankratops and Special Summoned Black Dragon Collapserpent banishing Crusadia Maximus. 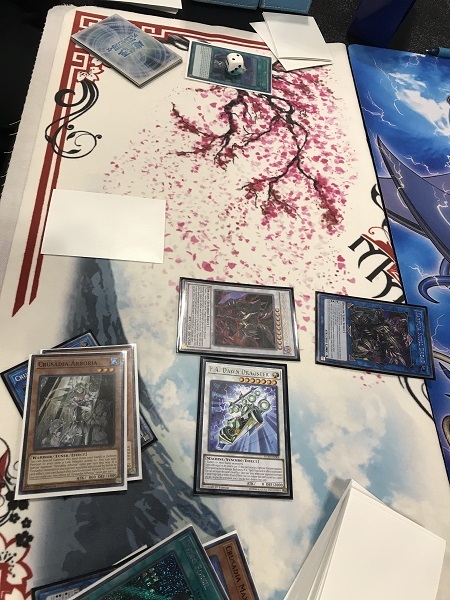 He activated Dinowrestler Pankratops, Tributing it to target Lee’s Set Salamangreat Rage which was chained to destroy Monk’s Black Dragon Collapserpent. Its effect let Monk add White Dragon Wyverbuster from his Deck to his hand. Lee activated Droll & Lock Bird. He Special Summoned White Dragon Wyverbuster and Normal Summoned Ash Blossom & Joyous Spring. He used both to Synchro Summon F.A. Dawn Dragster. Dawn Dragster attacked into Salamangreat Sunlight Wolf, inflicting 300 damage and leaving Lee at just 100 LP! Lee Normal Summoned Lady Debug. Its effect let Lee add Salamangreat Spinny from his Deck to his hand, then Baelynx was Link Summoned sending Lady Debug to the Graveyard. Salamangreat Gazelle was Special Summoned by its own effect from Lee’s hand, then the on-Summon effect sent Salamangreat Foxy from the Deck to the Graveyard. Spinny’s effect was activated in Lee’s hand, discarding it to boost Salamangreat Violet Chimera’s ATK by 500. Spinny was then Special Summoned from the Graveyard. Falco came out of the Graveyard by sending Gazelle back to his hand. Foxy’s effect was activated, discarding that same Gazelle to Special Summon Salamangreat Foxy from the Graveyard. He sent Spinny and Baelynx to the Graveyard to Link Summon Hiita the Fire Charmer, Abalze whose effect Special Summoned the Ash Blossom & Joyous Spring from Monk’s Graveyard, then Hiita and Ash Blossom & Joyous Spring were used to Link Summon Salamangreat Heatleo. Foxy and Falco were used to Link Summon Update Jammer. Then Heatleo was used to Link Summon another Heatleo thanks to Salamangreat Sanctuary, then Update Jammer’s effect negated F.A. Dawn Dragster’s effect reducing its ATK to zero! That was enough! Lee had enough ATK to end the match! What a Duel! 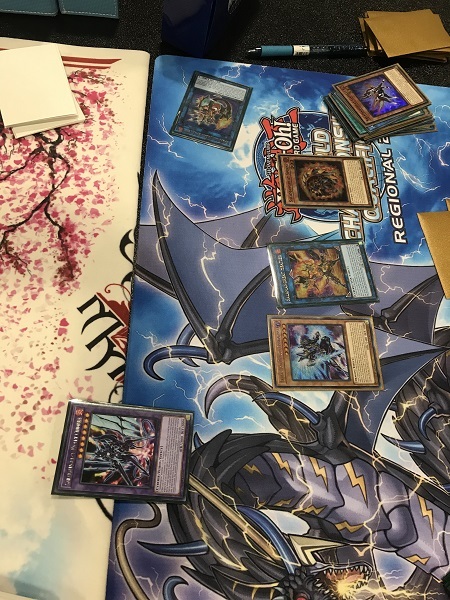 Kenta Lee comes back from 100 LP in game 3 and is your YCS Atlanta Dragon Duel Champion! 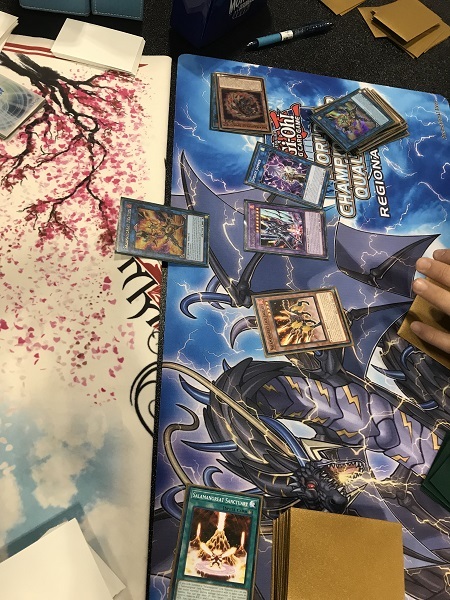 Team YCS Atlanta: Dragon Duel Playoff Winner Team YCS Atlanta: Public Event Playoffs Winners!